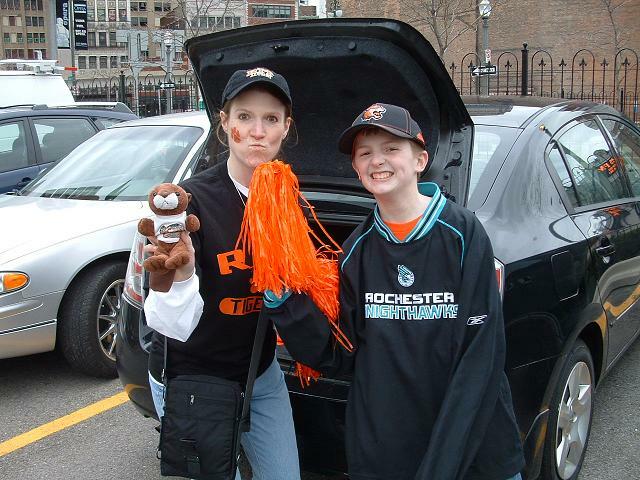 After watching RIT win the NCAA Men's Ice Hockey East Regional two weeks prior, we were inspired and caught up in the hoopla that is college sports playoffs! With that in mind, we grabbed up some tickets at Ford Field in Detroit, Michigan - where we were to become part of the largest crowd in history to watch an ice hockey game in person - and made our way there. We left on Wednesday morning around 8:30, and travelled up 81 to the Thruway. 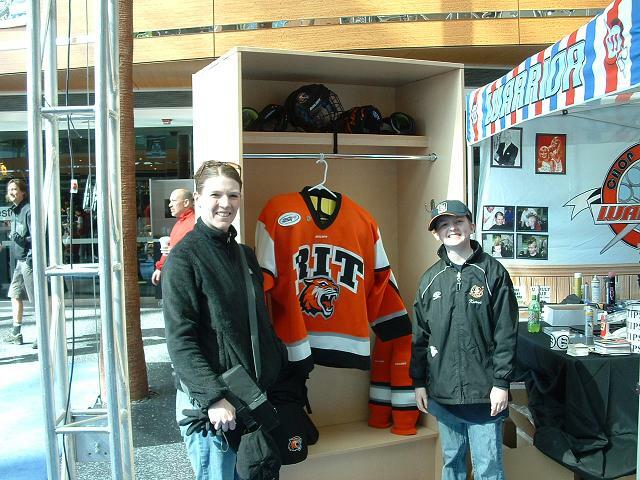 We had to make a stop in Rochester along the way, our destination being the RIT bookstore for some spirit garb! Fully RIT'd up (including a new RIT hockey sticker on the car), we continued west. For lunch, we stopped at the 'other' great place for wings in Buffalo, Duff's Famous Wings. Our family's taste test all agreed - Duff's was the better wing in Buffalo over the more famous Anchor Bar. We cut through Canada on our way to Detroit, snaking through Fort Niagara, Hamilton, and then across by London and through Windsor. We arrived in Dearborn, at the Doubletree Detroit, around 7:30. After getting settled in the room, we found some decent eats at Buddy's Pizza on Michigan Avenue. Back to the hotel for a well deserved nights sleep afterwards. Thursday rolls around, and it's GAMEDAY!! Time for the national semi-finals! We actually slept in a bit, and by the time we went for breakfast it was lunchtime. We found a place on Michigan Ave in Dearborn again for food, this time it was Leon's Family Dining. Good meal to start the long day! After breakfast/lunch, we headed downtown and easily found Angelina's - the site of the pre-game party that the RIT Alumni Association was hosting. 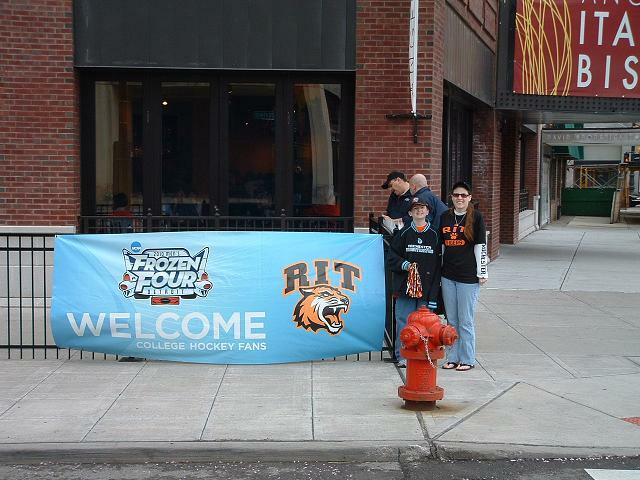 Here we had a few drinks, and talked with some of the other RIT faithful that had made their way to Detroit for the big game! Gettin' their game faces on! We finished up at Angelina's, and headed the three block walk towards Ford Field. Since all NCAA tournament events are 'dry' (we found that out the hard way in Albany!! ), we stopped across the street from the main entrance of the stadium for one more drink. Then, it was ON TO THE GAMES! This was our first trip to Ford Field, and it was quite an impressive facility. The record of the primary tenant notwithstanding (the Lions), this would definately be a 'destination' for us in the future for a football game. The had the stadium decked out in NCAA Men's Hockey regalia though, and even though it wasn't played in a traditional 'rink' it was pretty cool to experience none the less. As a side note, we were a part of 'history' by attending this game since it was the largest attendance for an indoor hockey game ever! 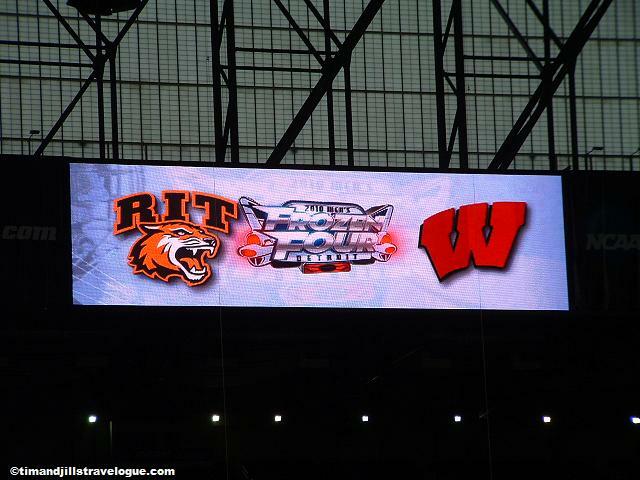 Game one pitted Jill's alma mater, the Rochester Institute of Technology Tigers, against the Wisconsin Badgers. RIT was having a Cinderella run in the NCAA tournament, and as I said above was the main reason we made the trip to Detroit. The section we sat in was right next to the RIT 'Corner Crew', and the rest of the folks that had purchased seats through the university or alumni association. Unfortunately, RIT's run came to an end in this game, with the Badgers moving onto the National Championship game. It was an awesome run though, and very cool to be a part of it. I'd be willing to bet next season will bring a new addition to the 'college hockey rinks' listing, that being Ritter Arena in Rochester. The boys saluting the RIT faithful post game - great run guys!! Between games, you had to stay in the stadium, so we made our way up to the second level to check out all of the displays and such they had up there. 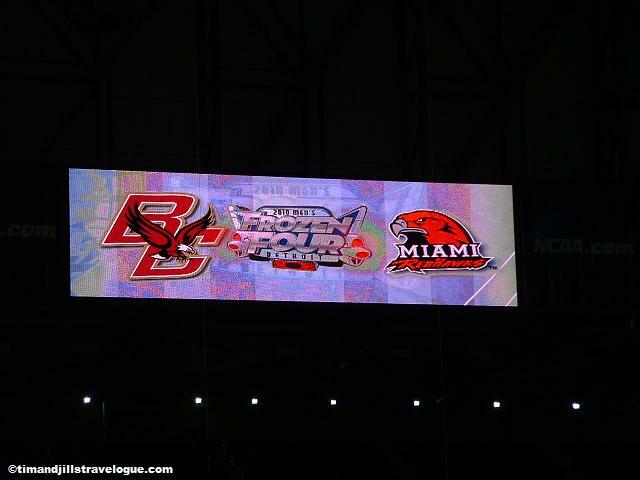 The second game of the day was between the Miami of Ohio Redhawks, and the Boston College Eagles. 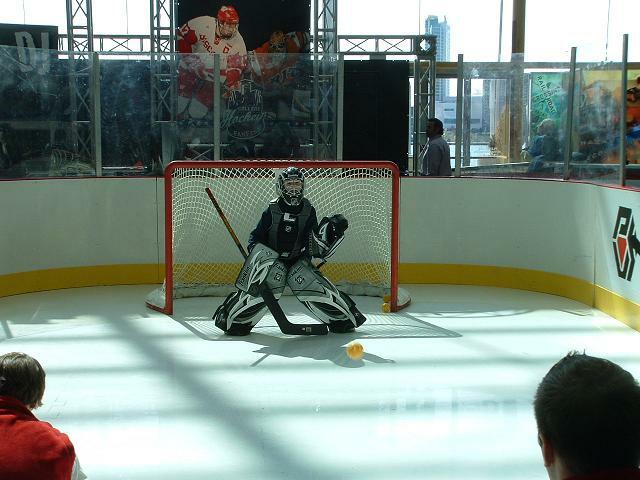 Michael had gone to Miami of Ohio the previous summer for goalie camp, so they were the obvious favorite for us! Well, that, and the fact that we don't cheer for teams from Boston - LOL! Unfortunately, we had the stroke of bad luck working for us on this day as the Eagles defeated the Redhawks, setting up a Wisconsin versus Boston College National Championship game. So, know what that meant? Yep, you guessed it! Time to sell the tickets! When we left the stadium, Jill and I both realized that we had absolutely no interest in either team playing so maybe it would be best to sell the seats and find something else to do. On Friday morning, I put the remaining three tickets on craigslist, and literally ten minutes later I had sold them! Bonus! As a side note to the second game, many of the RIT faithful stayed to watch it and cheer on the Redhawks - they somehow adopted that team. In the second period, we witnessed probably one of the funniest things we've ever seen at a hockey game. From behind us, suddenly the RIT folks started to 'coutdown'...FIVE...FOUR..THREE..TWO..ONE... I couldn't figure out what the heck they were doing since I looked up at the clock and there was still half of the period to play. When they reached 'ZERO', and the game clock reached the 10:00 mark, they all yelled 'HALFTIME'!! One of the funniest damn cheers ever at a hockey game! On Friday morning, we slept in again and took our time getting ready. So much so, it was lunctime by the time we headed out of the hotel. As I said above, on Friday morning while we were getting ready to leave, I put the remaining three seats on craigslist, and literally ten minutes later someone called about them! Very cool! For breakfast, I mean, lunch, we headed back to Buddy's Pizza on Michigan Avenue - good food, and as a bonus we got a bowl of mac and cheese! Woot! Apparently they messed up and made one, so instead of it going to waste they brought it to us - cool! After lunch, we hit the road south to Toledo - Holy Toledo! Our first new ballpark of the 2010 season - Fifth Third Field! 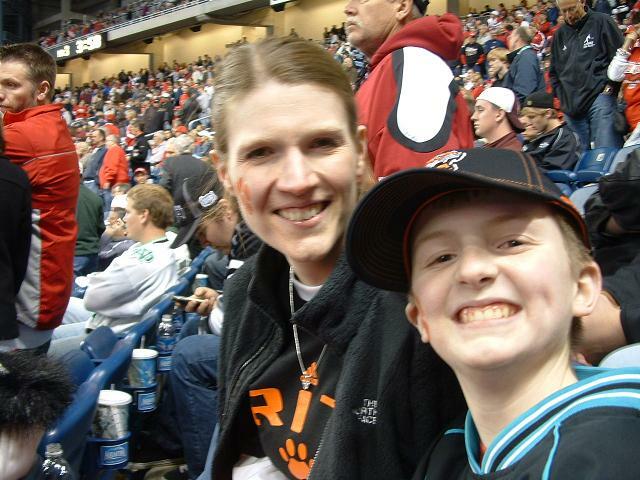 This would be our second trip to a 'Fifth Third Field', our first being last season when we went to the Dayton Dragons game. That would leave only one Fifth Third Field left for us to see, near Grand Rapids, Michigan. Nice park in Toledo, looked a bit like the ones we visited in Louisville and Indianapolis last year. 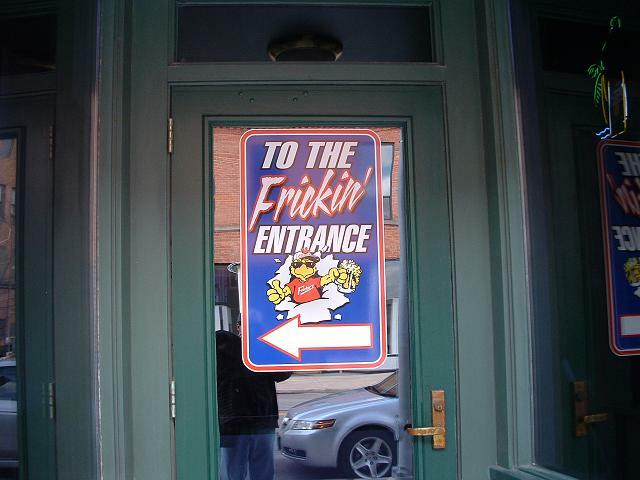 After the game, we went to 'Lickity Split' on Glendale Ave there in Toledo. Classic, old ice cream place - and yummy to boot! Back to Dearborn afterwards. Saturday morning we set and alarm and got up early. 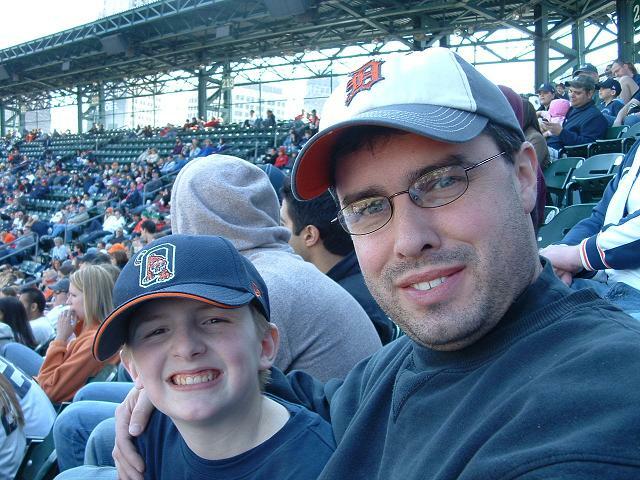 We had tickets to the Tigers game on Saturday afternoon, taking us to our second new ballpark in 2010 in as many days, and we wanted to wander around downtown Detroit before the game. We stopped at for some bagels before heading downtown. We parked in the same lot as we had the previous Thursday and then walked up to the YMCA station for the Detroit People Mover, their answer to 'mass transit' in downtown Detroit. It actually hit quite a few points, and if we were to come back again it would be worth staying downtown (for a reasonable price) close to the People Mover line. 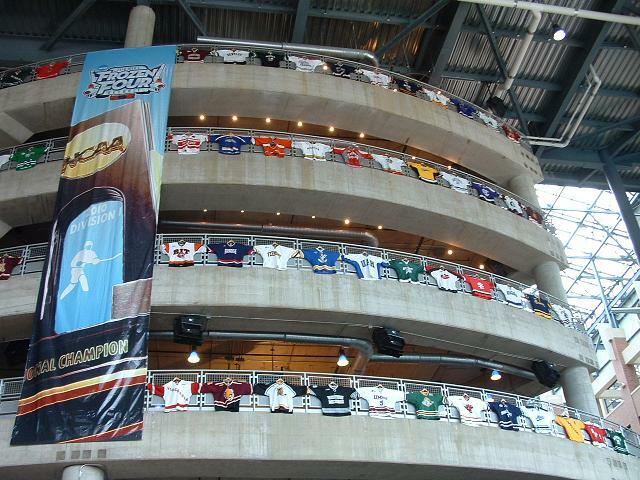 We took it all the way around once, and then on the second pass we stopped at the Detroit Marriott at the Renaissance Center where the fan fest was for the tournament. Mike took some shots, and stopped some shots, and we wandered around through the few exhibits there. Mike showin' them how it's done in Detroit City! 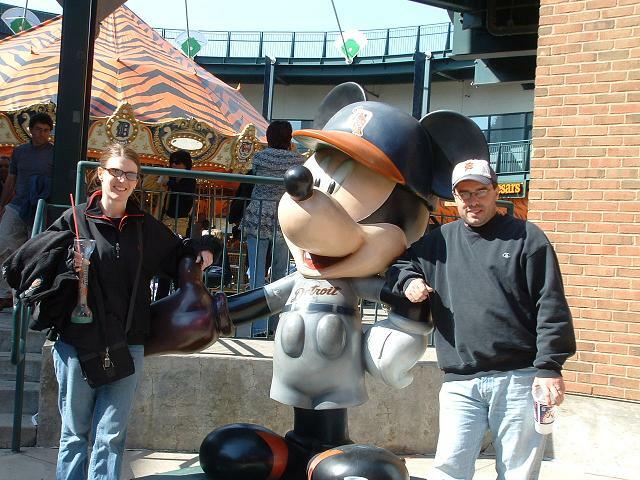 It was back on the people mover at this point, and around to Comerica Park! Stopped quick at the car to drop off some stuff, and then we headed a block to the game. At quick glance, and even closer inspection, it had a feel of CitiField in Flushing, which was good in our book since that's 'home'. We had grabbed up some 'cheap seats' on the first base side - they ended up being pretty good seats, and on the aisle to boot! Bonus! We actually stayed for the entire game as well, a rarity with us! Very nice ballpark, and definately a 'keeper' - we'll be back there someday that's for sure! We found a long lost friend at the Tigers game! We left the game, and walked across the street to Chelli's where I met the guys that had purchased the Frozen Four tickets. Then, with no other sports options available to us on a Saturday night, we headed to Dave and Busters near Pontiac to have some dinner, and let Mike play some games. Back to the hotel after that, where Mike did some swimming before bunking down for the night. On Sunday, we woke up early and checked out of the hotel. From there, we took Jill to the airport in Detroit (well, the outskirts of Detroit that is) where she caught a flight to San Diego. Then, Mike and I started the long trek home, across the bottom of Lake Erie this time, travelling through Toledo, then Sandusky and Cleveland, before stopping in Erie! 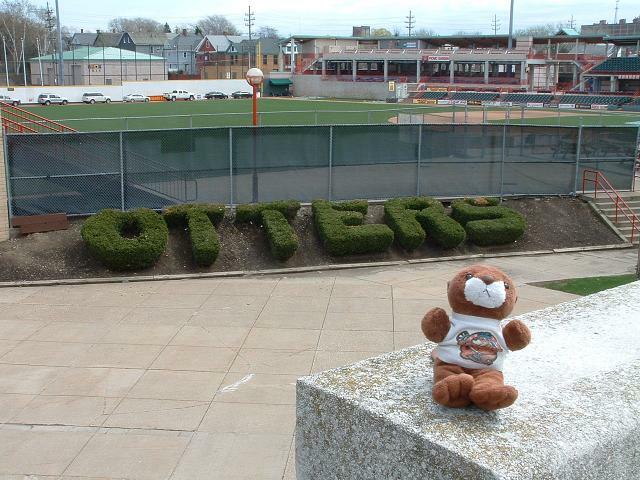 to grab lunch at the Quaker Steak and Lube, as well as snapping some pics at the Tullio Arena and Jerry Uht Park. Back on the road after that, and we finally arrived back in Binghamton around 7:30 on Sunday night. DETROIT -- Rochester Institute of Technology's magical postseason ride came to a crashing end this evening when the University of Wisconsin Badgers routed the Tigers 8-1 in the NCAA Frozen Four semifinals. The seven-goal margin is the largest in a Frozen Four semifinal since Denver defeated Harvard 9-2 on March 15, 1969. RIT allowed two goals in the first period, four in the second and two very late in the third and finished 28-12-1. The Tigers entered the game with the nation's longest winning streak (12 games). The Badgers (28-10-4) scored just 1:29 into the game, a really bad omen for RIT. The Tigers hadn't trailed in a game since Feb. 27, a string of 414 minutes, 7 seconds. When Derek Stepan tipped in a shot at 9:38, Wisconsin led 2-0. "Hey, we ran into just a powerhouse," RIT coach Wayne Wilson said. Penalties cost the Tigers greatly in the second period, when the Badgers twice scored during five-on-three power plays. "It's a tough pill to swallow right now, no question," senior captain Dan Ringwald said. "Hopefully in the next few days we can reflect on it and be proud of what we accomplished." 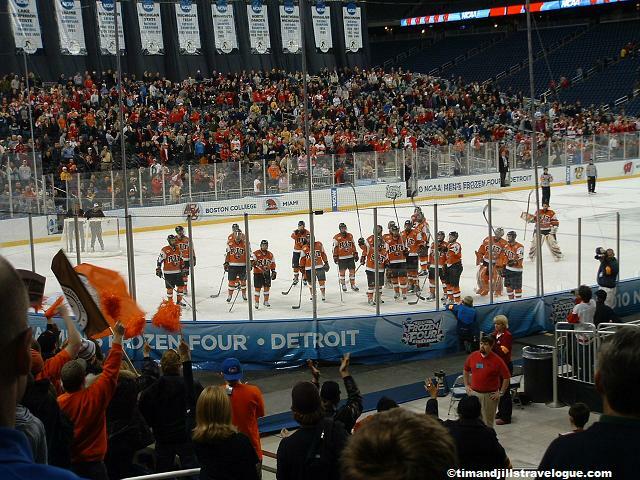 RIT is in just its fifth season as an NCAA Division I hockey program. The RIT hockey team will stay in Detroit tonight. Earlier, the team had planned to return to campus for a rally. "I think a lot of us felt honored and privileged by the attention from the faculty and staff and students," senior goalie Jared DeMichiel said. "We never knew we meant that much to the school." Check back for updates on an estimated arrival time. DETROIT � Boston�s Babe Ruth curse might be over, but another chapter has been added to Miami University�s own curse connected to the city in Massachusetts. It wasn�t so much a curse, naturally, as much as the Boston College hockey team outplaying and outscoring the top-ranked RedHawks 7-1 in the Frozen Four semifinals on Thursday night, April 8, at Ford Field. Still, it marked the fifth straight year Miami�s NCAA Tournament run was ended by a team from Boston. A crowd of 34,954 watched Boston College take a 3-0 lead into the third period. �You�ve got to take chances and now you�re playing their game,� Blasi said of the Eagles, who like to push the pace on offense. The RedHawks did pull within two on a goal from freshman defenseman Joe Hartman with 14:41 left in the third period. The goal was assisted by Carter Camper and Tommy Wingels. But the Eagles responded with three goals � by Cam Atkinson, Patch Albert and Paul Carey � in a span of 1 minute, 35 seconds. Then Ben Smith�s second goal of the game with 3:39 remaining made it 7-1. Smith had opened the scoring with 1:28 remaining in the first period, and Boston College scored twice in a span of 62 seconds early in the second period on goals by Jimmy Hayes and Joe Whitney. At that point Cody Reichard replaced starter Connor Knapp in goal for the RedHawks, who finished the season with a 29-8-7 record. Blasi was asked if he removed Knapp because he was dissatisfied with his play. The answer was no. Wingels, Miami junior and team captain, said the RedHawks had made a priority during practice of not turning the puck over. �And what did we do? We turned the puck over,� Wingels said. The six-goal deficit was the most lopsided loss of the season for the RedHawks, who had not lost by more than three goals in any previous contest. �It was pure frustration,� Palmer said. Boston College (28-10-3) will take on second-ranked Wisconsin for the national championship on Saturday, April 10. The Eagles eliminated Miami three straight times in NCAA regional play in 2006, �07 and �08, and last year the RedHawks lost a 4-3 overtime thriller to Boston University in the NCAA title game. Baseball experts will tell you the numbers in the game usually do not lie. Last night's 7-4 win by the Mud Hens over Louisville at Fifth Third Field was a good example to the contrary. Through four innings, Bats starting pitcher Travis Wood had struck out nine, walked one, and allowed no earned runs. Meanwhile, his Hens counterpart, fellow lefty Phil Dumatrait, had issued five walks with no strikeouts. The net result of this divergent mound work? Toledo owned a 5-3 lead. The Mud Hens (1-1) rallied to that fortuitous lead with four unearned runs in the fourth inning. Jeff Frazier reached on a one-out error, Will Rhymes and Robinzon Diaz each singled to load the bases and, after Wood fanned Danny Worth, Clete Thomas pulled a sharp two-run single to right and Brent Dlugach followed with a two-run triple to the gap in right-center. "Early in the game [Wood] had us," Hens manager Larry Parrish said. "We were swinging and missing a lot. We were just looking to see if a guy could hit the ball forward there for a while. "Then, it seemed like when we got it rolling, we started backing-to-back good at bats." Dlugach, who was 3-for-5 in Toledo's season-opening 5-3 loss to Louisville Thursday, later doubled Thomas home and scored on a Brennan Boesch single for the 7-4 lead in the seventh. "He's swinging like he doesn't want to play here very long," Parrish said of Dlugach, who has started the season hitting .556. "I feel pretty good up there," Dlugach said. "I'm trying to just be relaxed and hit a good pitch. It feels good to get some big hits. "The thing in those [scoring] situations is getting a good pitch to hit, putting a good swing on it, and not missing it. Dumatrait had trouble locating the strike zone from the outset, throwing half of his 58 pitches for balls and issuing all five of his walks through three innings. A double play helped him out of trouble in the first inning, and a fielder's choice grounder enabled him to keep the Bats scoreless after two two-out singles in the second. But three walks and a double steal by Louisville's Chris Burke and Chris Heisey resulted in a 1-0 lead for the Bats in the third with Burke scoring on Todd Frazier's groundout. The Hens were busy flailing away at Wood, striking out for their first eight outs of the game before tying things with two out in the third. "[Hens hitters] were saying they were having trouble seeing him early," Parrish explained. "Lefthanders here throw out of the sky for a backdrop, where with righthanders you've got the SeaGate [building]." Wood surrendered singles to Diaz and Worth and, after fanning Thomas and Dlugach to bring his strikeout total to eight, yielded a single to Boesch. Diaz scored when the ball skipped away from Todd Frazier in left. "Those first few innings were weird," Dlugach said. "It's just one of those things in baseball. You've just got to keep going. "There's nine innings for a reason, and we still had five left. 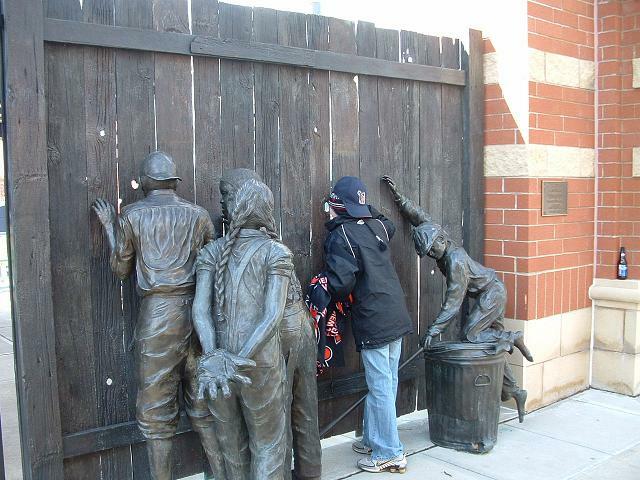 Luckily we were able to come back and get 'em." The Bats went up 3-1 in the fourth when Drew Sutton and Chris Valaika each doubled to right off Dumatrait for the first run, and Burke's double-play grounder got Valaika home. Louisville loaded the bases against Hens reliever Scot Drucker (winning pitcher, 1-0) with two out in the sixth. But Josh Rainwater came on to end that threat thanks to Boesch's diving grab of Zack Cozart's sinking liner to right. The Bats got within 5-4 in the seventh when Dorn singled and Luis Terrero doubled him home. Toledo's relief corps combined to allow just one run on three hits in five innings. "That's one of the things that we thought we were pretty strong at," Parrish said of the bullpen work. "From the first two games, that's proven to be so." Hen closer Jay Sborz worked a 1-2-3 ninth to earn the save. DETROIT -- Jeremy Bonderman can remember having big days like this that probably don't seem so long ago. Ryan Perry has never had a day like this, which explains the adrenaline he was feeling. What Bonderman was able to start for the Tigers on Saturday, Perry was able to finish. And the same 4-2 win over the Indians that made Bonderman look a little younger after a season and a half essentially on the shelf, made Perry seem all the more mature after barely a year in the big leagues. "It's special that I could go out and get a 'W'. It's been two years," Bonderman said. "It's been a long journey back, but I'm hoping I've got 35 more good starts in me. Hopefully, we'll do something special." It has the makings of a special start for the Tigers, who are racking up the wins against Cleveland and Kansas City that they struggled to find at times the previous three seasons. At 4-1, they're off to their best start since 2006, when they won their first five games on their way to an eventual World Series appearance. That season came out of nowhere, but Bonderman's breakout that year was seemingly expected of him ever since he made the Tigers rotation in 2003. His shoulder surgery to correct a circulation problem in 2008 and the struggles to get back to this point basically erased expectations on what's left of his career. Yet as he went about attacking Indians hitters with a splitter, the offspeed pitch he never had before he was hurt, he showed a side of pitching he never quite captured before. "That was really Jeremy Bonderman the pitcher," manager Jim Leyland said, "not Jeremy Bonderman the 95-96-mph fastball, hard slider. He pitched, and that's the adjustment that he's going to have to make. We're tickled to death today. That's progress, and that's something you have to build on." Or as Leyland said at another point, "That's really the best I've seen him pitch in a long time." Despite a 92-mph fastball that suggests he's gaining velocity, Bonderman wasn't a power pitcher Saturday, yet he was a deceptive one. He struck out three of Cleveland's first four hitters, the veteran heart of its batting order, by working ahead with fastballs to set up sliders and splitters. He allowed just two solidly hit balls his first time through the Indians' lineup, then came back around to strike out Asdrubal Cabrera and Grady Sizemore a second time by letting them watch 92-mph fastballs on the corner. "I was able to get guys looking for other stuff," Bonderman said. By itself, the splitter wasn't a swing-and-miss pitch, though Travis Hafner went down on a checked swing at one leading off the second inning. In tandem with his other stuff, though, it had that kind of impact. "We threw it sometimes first pitch, or when we were ahead in the count," catcher Alex Avila said. "We threw it a couple times behind in the count, but really the game plan was to get in a rhythm throwing strikes and just incorporate both the slider and the splitter." Everything was working to perfection through 11 batters. Then Bonderman started off Shin-Soo Choo with back-to-back splitters that missed the corner. A 3-0 count and an eventual walk followed, then another 3-0 count for a Hafner single. Once Jhonny Peralta worked Bonderman for 12 pitches and another walk, he was struggling. "I felt fine until Peralta wore me down," Bonderman said. "Until then, I felt great. I was rolling until that point." A splitter in the dirt scored Choo, but Bonderman retired the last four batters he faced to get through five and get in line for his first Major League win since May 22, 2008. Perry was still in college at that point, not that that's a long time ago for him. Bonderman, on the other hand, was on the disabled list when the Tigers drafted Perry, and on the DL again when Perry made the Major League roster out of Spring Training last year. As Bonderman was wrapping up his effort, Perry was still sitting in the bullpen, a few innings away from his call. But with Jose Valverde, Joel Zumaya and Phil Coke all being rested Saturday, Perry knew his call would be coming in a save situation if they had the lead. "Sixth inning on, I was anxious just sitting there," Perry said. "I've always wanted the opportunity to come in and try to get a save, see what I can do." At age 23, it's a little sooner than most pitchers for a first chance at save, but Perry has long since defied age expectations. Once Fu-Te Ni hit back-to-back batters in the eighth, Perry was on for the save sooner than he would've expected Saturday, facing Peralta with two outs in the eighth. He was about as energetic as everyone expected. "Perry's always amped up for everything," Avila said. "I knew he was going to be throwing hard." The difference is that it's harnessed energy. "Especially coming in in the eighth, my heart's pounding a little," Perry said. "But I think my confidence has grown since last year, so I'm able to control it, keep my body in position to succeed, instead of just sporadically trying to throw the ball." It was tested Saturday. Once he struck out Peralta on a nasty slider, he had to sit through the bottom of the eighth inning. He came back for the ninth and retired Cleveland in order, capped by a 98-mph fastball to pinch-hitter Luis Valbuena. Perry got the game ball and the save. Bonderman got the win. The Tigers got another big step.